At last Blind Harry's epic poem is now available in the first accessible edition published since 1859. Enormous credit is due to Elspeth King and her colleagues at the Smith Art Gallery and Museum in Stirling, and to Luath Press for bringing this about. Great credit it also due to Owain Kirby for his wonderful illustrations (see book cover opposite). Racy, blood on every page, violently anglophobic, grossly embellished, vulgar and disgusting, clumsy and stilted, a literary failure, a great epic. Whatever the verdict on BLIND HARRY, this is the book which has done more than any other to frame the notion of Scotland's national identity. 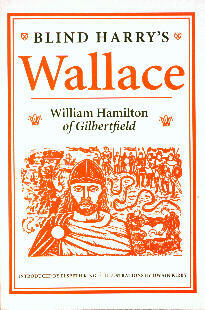 Despite its numerous 'historical inaccuracies' it remains the principal source of what we know about the life of Wallace. 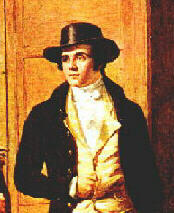 Robert Burns The novel and movie Braveheart were based on the 1722 Hamilton edition of Blind Harry's epic poem. Burns, Wordsworth, Byron and others were greatly influenced by this version 'wherein the old obsolete words are rendered more intelligible', which is said to be the book, next to the Bible, most commonly found in Scottish households during the eighteenth century. Burns even admits to having 'borrowed ... a couplet worthy of Homer' directly from Hamilton's version of BLIND HARRY to include in 'Scots wha hae'. If you would like to get a copy of this book then please click here.